Your Support Can Help Shubam Survive A Chronic Heart Disease And Live! Shubham, 8, is the son of a poor agricultural worker from Maharashtra. He has a chronic cardiac problem and needs just one surgery to get better. His father, an agricultural worker, does not have any money to treat Shubham. Just 12 days after he was born, the doctors informed Shubham's parents Tanaji and Sheetal that he had a weak heart. "But they that with some care he would get better. For a long time, we didn't realise that it was Shubham's heart that was troubling him," Tanaji says. Tanaji and his wife are agricultural workers in Sholapur, Maharashtra. They are daily-wage labourers who make 200-250 per day if they can find work. If they don't find work, they earn nothing. Today they live with the knowledge that their poverty affected Shubham health detrimentally. Even as Shubham fell sick will respiratory tract infections every month, the local doctor only prescribed antibiotics. The main cause for Shubham's illness ended up being completely neglected because there were no facilities in their village dispensary. 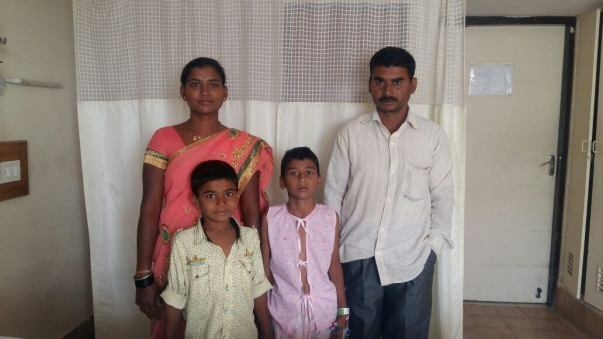 His younger brother Shreya, 7, cannot remember a time when Shubham was healthy and active. 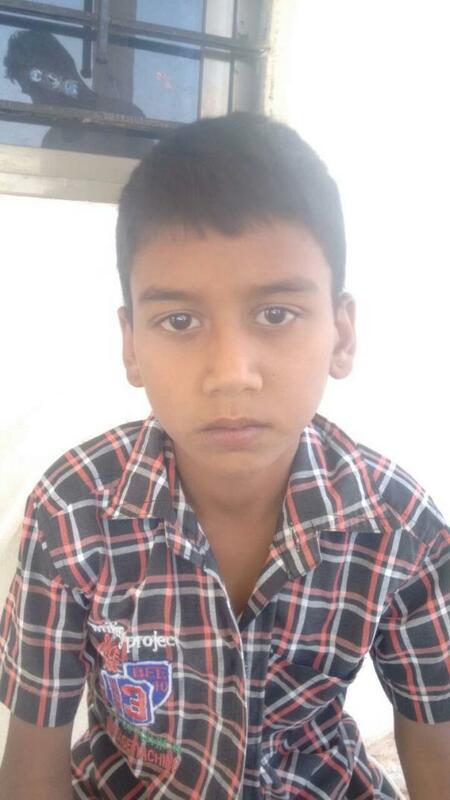 Shubham has palpitations and cannot do any of the things other children his age enjoy - like running and playing. He falls sick with fever and bronchitis frequently. At present, he cannot go to school like a normal child. 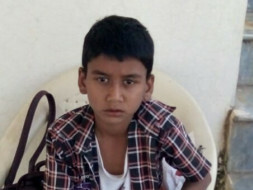 Shubham's parents feel helpless at their own inability to take Shubham to a'city' and get him a checkup at a hospital. But one day, Tanaji's family friend visited them and saw Shubham's frail condition. 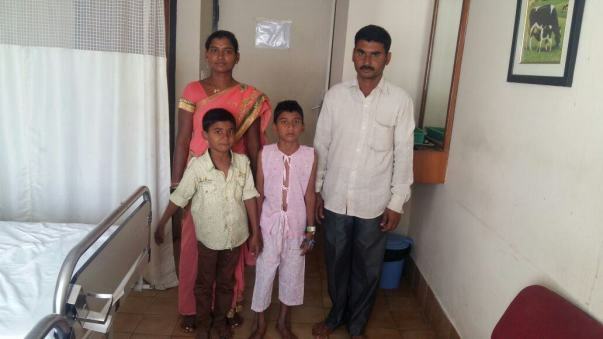 Having got his daughter treated at Manipal Hospital, Bangalore, he advised them to take Shubham there. His assurance was crucial in getting the family to seek help for Shubham. On October 4, 2016 Subham was brought to Manipal Hospital and consulted Dr Devananda who diagnosed Shubham with Chronic Heart Disease. 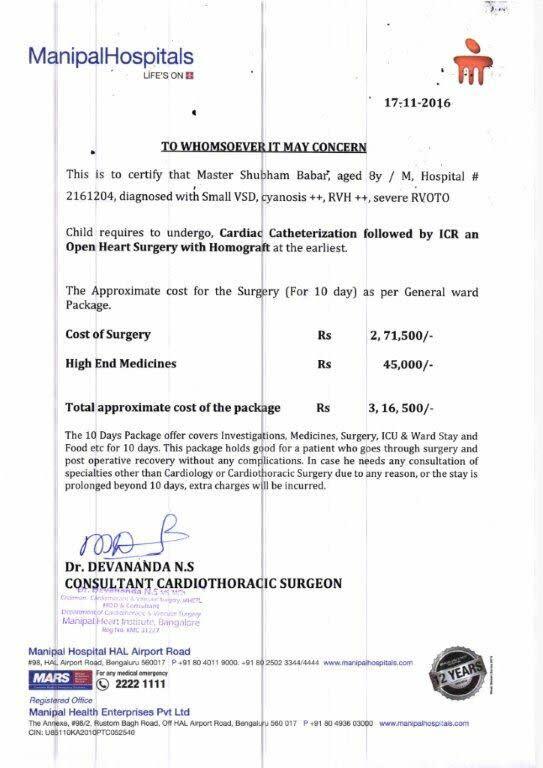 The approximate cost of surgery is Rs 3,16,500. His parents cannot afford to pay for his treatment. But the lack of funds should not be the reason why Shubham can't get the surgery that can cure him. Please help Shubam have a normal life. Contribute now. I am Debotri, a fellow at Milaap. Here is an update on Shubham's health. I spoke to Shubham's father, Tanaji, this morning. "My child is doing well. Due to the complications, the only ray of hope was an early treatment. He got operated at Sahyadri Hospital, Pune. My child was admitted to the ICU for almost 2 weeks. Currently, he has improved a lot. He is extremely happy to go to school. I feel good to see him getting better with each passing day", he said. The family has to go to Pune for the regular checkups. His monthly medical expenses are almost Rs 2000. Thank you, donors, for your support and contribution.